Posted on March 24, 2019 by Admin Posted in Catholic Articles	. Tags: #God is our refuge and our strength; and ever-present help in distress. #Psalm46:2 #Amen.	.
Posted on March 10, 2019 by Admin Posted in Catholic Articles	. On this first #Sunday after #Lent, recall how #Jesus overcame #fasting and #temptation for 40 days and 40 nights in the desert. When we are tested, we too can #endure all circumstances with #hope, #patience, and #prayer – #Romans 12:12! #Amen! Tags: Amen, endure, fasting, hope, Jesus, Lent, patience, prayer, Romans 12:12, Sunday, temptation	. Posted on February 18, 2019 by Admin Posted in Catholic Articles	. Most holy and immaculate Virgin, Mother of Jesus and our loving Mother, being His Mother, you shared in His universal kingship, The prophets and angels proclaimed him King of Peace. With loving fervor in our hearts, we salute and honor you as Queen of Peace. We pray that your intercession may protect us and all people from hatred and discord, and direct our hearts into the ways of peace and justice which your Son taught and exemplified. We ask your maternal care for our Holy Father who works to reconcile the nations in peace. We seek your guidance for our Head of State and other leaders as they strive for world peace. Glorious Queen of Peace, grant us peace in our hearts, harmony in our families, and concord throughout the world. Immaculate Mother, as patroness of our beloved country, watch over us and protect us with your motherly love, Amen. Tags: Amen, Immaculate, Mary, Pope, Queen Peace, Virgin	. Meaning of the 4-Way Cross! Posted on November 25, 2018 by Admin Posted in Catholic Articles	. The four way cross, or cruciform, is seen frequently in religious imagery and jewelry, the latter usually cast in beautiful sterling silver or gold. Religious imagery medals first became popular in the 16th century when the images became recognized as a symbol of faith and devotion. Today, the cruciform is widespread and worn by many. But have you ever wondered what the four way cross symbolizes? This humble medal actually has a very rich and vibrant history. The Sacred Heart – At the top of the cruciform is the sacred heart of Jesus, an image where Jesus points to His exposed heart, topped with a crown of thorns. The sacred heart represents sacrificial love and mercy that Christ has for humanity. Joseph – On the left side of the cruciform you will find St. Joseph holding a lily and baby Jesus. 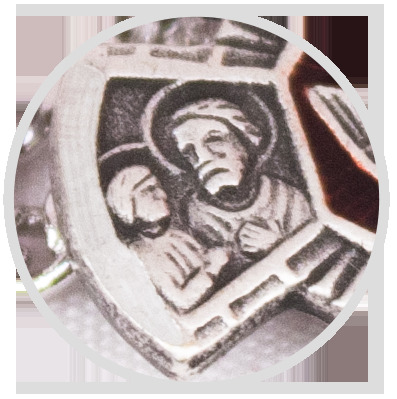 As Jesus’ foster father, the image of St. Joseph represents guardianship and protection. The lily in his hand symbolizes righteousness and purity. 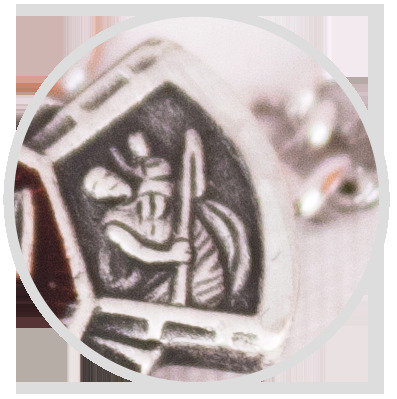 Christopher -The right side of the cruciform depicts St. Christopher, with baby Jesus strapped to his back, navigating across a stream of rushing water. There are actually three meanings to this image: Christians must always carry the teachings of Jesus with them, they should always offer help to others in need, and they may ask St. Christopher to pray for them when embarking on a long journey. 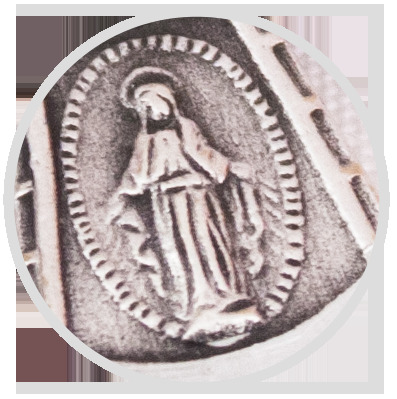 Miraculous Medal – The miraculous medal can be found at the bottom of the cruciform, and it represents the earliest biblical prophecy of the Jewish messiah. In the image, the Virgin Mary stands atop the world, crushing a snake underfoot. There are also several meanings to this image: Mary represents the origin of Jesus, the globe beneath her feet symbolizes Jesus’ kingship over the world, and the crushed snake represents Jesus’ ultimate triumph over evil. Dove – The middle of the cruciform depicts a dove, which signifies the Holy Spirit and often symbolizes baptism. The symbolism to baptism comes from the dove that came over John the Baptist as he was baptizing Christ. The images on the cruciform taught newcomers to Catholicism about the faith and its founders. They were a physical representation and a link to the heroes of Christianity. 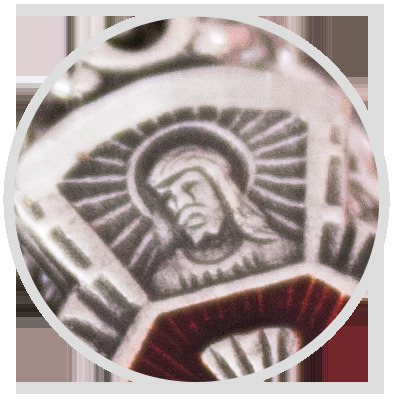 Because the medal features these four images fused into a cross, the medal itself represents that devotion to the saints, Mary, and Jesus, are all unified within the Catholic faith. The origins of the four way cross are a bit of a mystery. It is not known when or why it was first created, but experts believe it was made as a more convenient way to wear the four individual medals, without wearing them all separately on a chain. The back of the medal displays Our Lady of Mt. Carmel and the Miraculous symbols with a phrase similar to, “I am a Catholic please call a priest.” This is inscribed on the medal so that if someone saw it in an emergency, a priest could be called to pray for the wearer or the medal. The four way medal is most often found in the shape of a cruciform, although medals do vary widely and may not always be cross-shaped. The cruciform also varies in ornamentation: some are in the shape of a simple Latin cross, while others may be made in the ornate Maltese cross shape. Sometimes the four medals are not in a cross shape at all, but are instead inside an oval or circle. Usually, a medal that is found in this shape will have a cross engraved in its center. McVan, Inc. has a large collection of four way medals so don’t forget to visit our online catalog and place your order today.